When I came across this recipe in my reader, I thought it’d be worth a shot to see if a baked cinnamon sugar doughnut would be anything like the fried ones from the flea market. 1. Preheat your oven to 450. Coat your doughnut pan with non-stick cooking spray. 2. In a medium sized bowl, stir together the dry ingredients. Then add in the wet ingredients and stir until combined. 3. Fill each doughnut hole halfway with batter and bake for 4 minutes. 4. Let doughnuts rest in the pan for 2-3 minutes then use a butter-knife to gently remove from the pan and place on a wire rack. Repeat with remaining batter. To dust with cinnamon sugar, combine the sugar and cinnamon together in a small bowl. Brush the tops of the doughnuts with melted butter then immediately dip into the cinnamon-sugar mixture. Flip doughnut over and repeat with other side. For the chocolate glaze, place the chocolate chips in a microwave safe bowl and melt at 30 second intervals, stirring after each until the chocolate has melted. Stir in the corn syrup and microwave 20 seconds. Stir in the canola oil and microwave another 20 seconds. Stir in the vanilla. 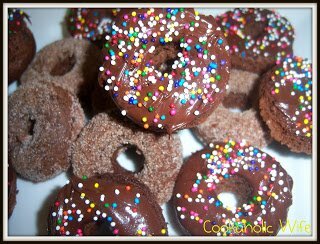 Swirl each doughnut into the chocolate glaze and then top with sprinkles. Even though these are chocolate, when covered in cinnamon sugar, these are actually quite similar to the fried ones from the flea market, but if you’re expecting a baked doughnut to taste anything like a Krispy Kreme, well, these just aren’t for you.